Fabric Paper Thread: Coastal Inhabitants Then and Now. Coastal Inhabitants Then and Now. The Broughton Archipelago is a maze of channels, islands, islets, narrow twisting passages and very few people. However, it is not completely uninhabited. During the first three-quarters of the 20th century, First Nations villages and European settlements were found in much greater numbers than currently. Most of the European settlements were on floats, not on cleared land, and I'll write about them in another post. For today, I thought I'd tell you about some of the First Nations peoples who have lived here for thousands of years. 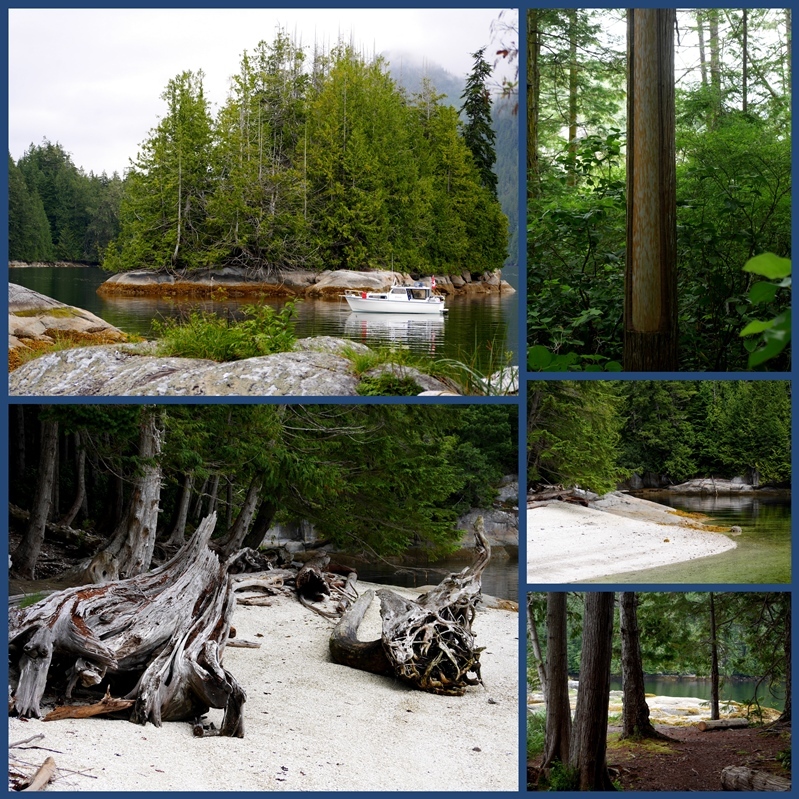 We visited New Vancouver, also known as Tsatsisnukwomi, which means "Eel grass along the shore." The village is currently occupied by members of the Glendale family, whose grandfather wanted his family to live traditionally, and to not lose the old ways. There are 8 homes, a variety of outbuildings, a dock, and a Big House, seen in the bottom right photo above. A young woman gave us a tour of the village, and told us her family's story. We were permitted to enter the Big House where ceremonies occur such as potlatches occur. The sweet fragrance of cedar filled the building. Regalia and special carvings are kept there and she explained each one's significance. 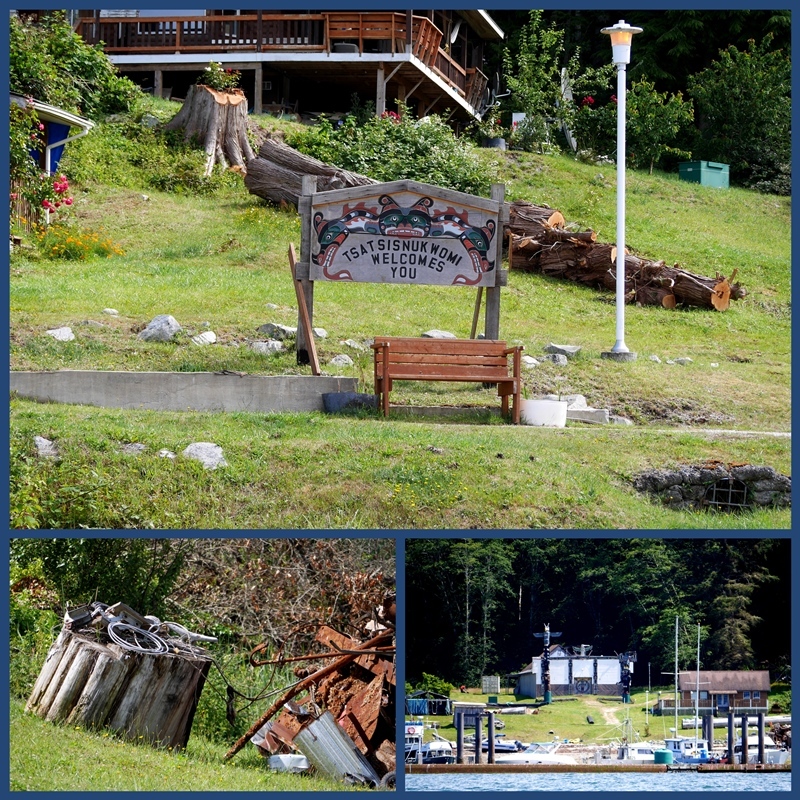 On Village Island, within sight of Tsatsisnukwomi, is the empty village of 'Mamkwamlis, also known as Mamalilikulla. 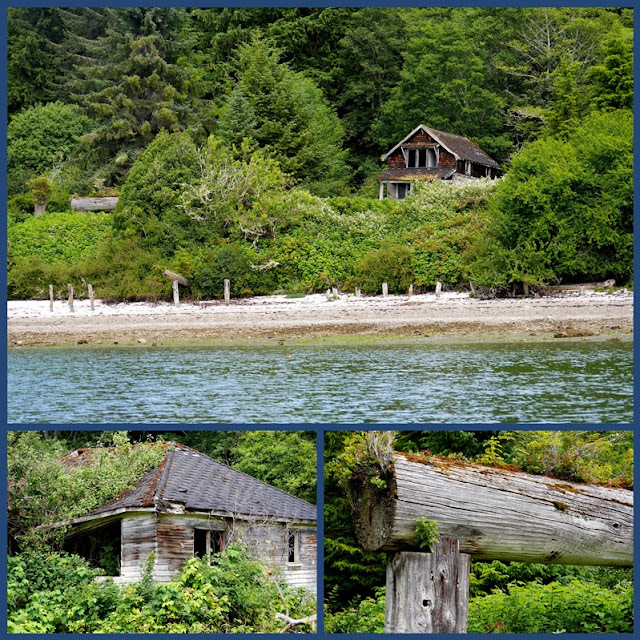 Here one can see the tangles of blackberries and salal bushes encroaching upon the old buildings. Along the foreshore, remnants of the stilts that once supported houses weaken with each rise and fall of the tide. M. Wylie Blanchet, author of The Curve of Time, was a widow who explored this area in the 1930s with her 5 children and a dog. If you can find a copy of her book, you're in for a fascinating read. There's another book called Following the Curve of Time in which Cathy Converse retraces Blanchet's travels. It's also excellent. We spent another pleasant morning exploring the Burdwood Group, a cluster of small islands and rocky islets between Raleigh and Hornet Passages. It's a popular place for kayakers with a number of white shell beaches where First Nations peoples once harvested clams. The white beaches are composed of millions of fragments of clamshells. The top right hand photo shows a culturally modified tree. A strip of bark is taken from the cedar tree for traditional basketry and other handicrafts. The trees continue to survive. There's a rough trail across the island that gave us a bit of exercise. We saw five bears during our trip - always at low tide on rocky beaches. The bears turned over great rocks with a toss of their front legs looking for sea creatures trapped underneath. Fascinating to watch from the safety of the boat. I wrote about an encounter with a mother bear and her cub while hiking a few years ago, and I had no wish to relive the experience. We did very little hiking on this trip. I'll leave you with a photo of wildflowers - fireweed and tansy ragwort, bright spots of colour against the unending green forest. How wonderful to visit the Glendale family village and to know they are honoring their grandfather's wish. The two books you mention sound like very interesting reads. This reminds me of the area near Terrace way up in the North. I went to the Kitamaat village, home of the Haisla people, so very interesting to see the artifacts and paintings. There is so much history belonging to the First Nations. Such fascinating places to visit, the history of the families who lived there, the scenery and the wildlife virtually on your doorstep. loved seeing it all through your camera lens today @ MM. Such an interesting post. I have taken note of the two books, I am ever hopeful that I might get lucky in the library. I'd love to read those books. I'll write them down in my reading list. What amazing sighting of the bears and I love how you described the cedar scented fragrance! Hugs! The Broughton Archipelago area looks stunning. I'm always interested in learning about the First Nations people. I was an anthropology major and loved learning about the Native peoples in New Mexico. I'm going to look for your book recommendations. Wonderful post. How in the world do you pronouce Tsatsisnukwomi or Mamkwamlis? Whoa! Look at those bears. Love the first shot you captured. Lovely images. I would also prefer to encounter the bears from a safe distance, in a secure vehicle! A lovely, serene place to visit indeed, Also interesting reads you have suggested. Such interesting information about the First Nation people. Lorrie. I feel sad how many indigenous people were forced from their lands and worse, killed, by settlers, all over the western hemisphere by peoples from the eastern hemisphere. It seems ,ore respect and understanding is being given by the present generation, but more still needs to be done. 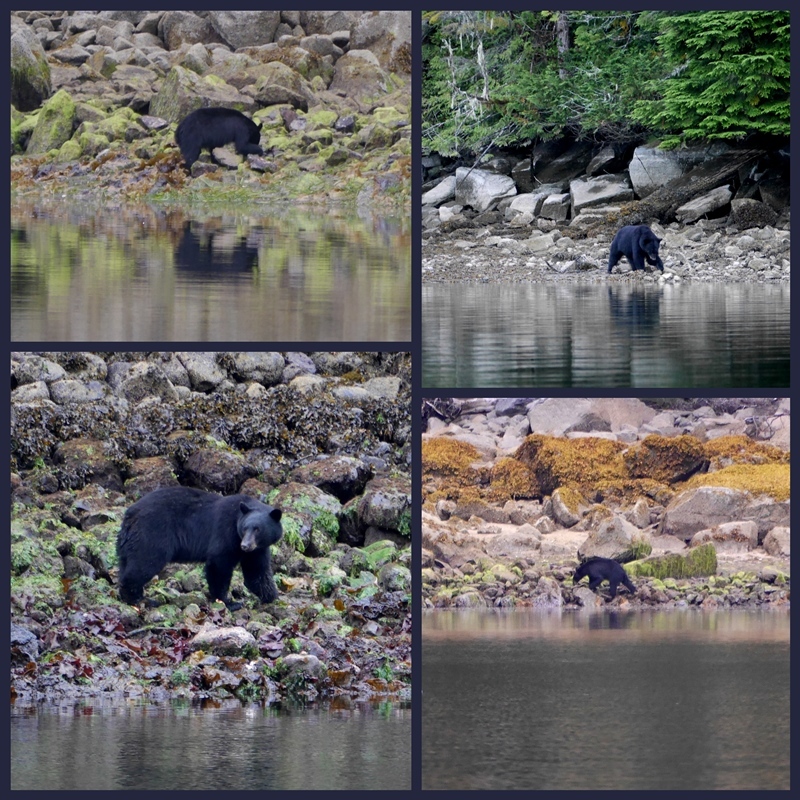 Seeing the bears walking along the shore from the safety of your boat must have been thrilling. I agree I would not want to come across a bear, particularly a mother bear with a cub, while hiking! I try to make a lot of noise when walking in bear country to hope I frighten they away, but I also carry bear spray. Lorrie, What a wonderful post. It is always good to learn a bit about where we live. It was good to see the Glendale Family Village. I will keep an eye out for the books as they seem very appealing. have a great week. Sylvia D.
It must have been really interesting to learn from a member of the Glendale family how they have managed to lived and survive in such an isolated spot for thousands of years. Great images of the black bears, and how huge they are compared to my little Sloth bear seen in Sri Lanka. I always enjoy seeing those long swathes of fireweed (known as rosebay willow herb here) especially when they are offset by such a striking background. What a beautiful and interesting place! It would be lovely to see a bear - from a safe distance. Thank you for your comment today! Around the pole, in the water, you can see the London Aquatics Centre's reflection. What fascinating information you've shared with us, Lorrie, on the First Nations people and their land. Your photos are stunning, as always, and I'm glad that you were safely away from those bears. Enjoy the rest of your summer in your beautiful area. Your first photo is a show stopper! I've never seen a low cloud formation like it. And I must look up the word archipelago. I know the word but just realized I don't know what it means. I would like to read The Curve of Time sometime. The thought of her taking her 5 children there alone back then makes me want to know more about her. Lorrie, reading about the Glendale family keeps making me think of something very similar in one of Louise Penny's books when Armand goes to a settlement like that. Maybe it was fictional and not the same but it sure does remind me of it. You do get to interesting places with your little boat. It always seems a little extra special to hear accounts of history from someone who is a descendent. That was the best boat trip *ever* .... i'm in awe!! Beauty, history, lovely weather .... perfect!! it is wonderful that you got a personal tour of the family village (and wonderful that they continue to maintain it and live there). Assume those books are out-of-print (and maybe mostly available used in Canada)... I will check though. Awesome. We here in Trinidad and Tobago recently honoured our first peoples with a public Holiday in October 2017. I am fascinated that the village is composed entirely of one family … I hope they get along! The shell beaches are stunning - I really liked your photo with the tree stumps on the beach. And the bears - oh my! So glad you observed them from the safety of the boat! What a great sounding trip. Loved reading your post for the information and your photographs are always a joy to see.